The Gordon Racing Team formally ‘presented itself’ last week – in anticipation of a best ever season to come. The Belgian team will again enter the LMS series and the Spa 24 hours but the significant addition this year is that prestigious place at Le Mans, which was confirmed in the second batch of entries (granted in February). In the LMS and at Le Mans, the young Frenchman Romain Iannetta will join the (otherwise all Belgian) team. Iannetta drove for Noël Del Bello and Belmondo last year, in respectively a Courage C65 and a Chrysler Viper. At Spa, it will probably be Marc Duez in the car. 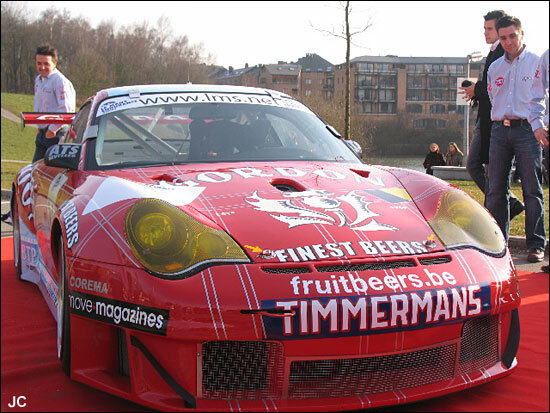 He drove in a Gordon Porsche 996 in opening round of the Belgian rally championship earlier this year. As the Nürburgring 1000K is just a fortnight before the Spa classic, the team could decide to switch to another car. Dreaming of a GT1, Christian Lambert smiled when asked if the PSI C5-R could be an option.